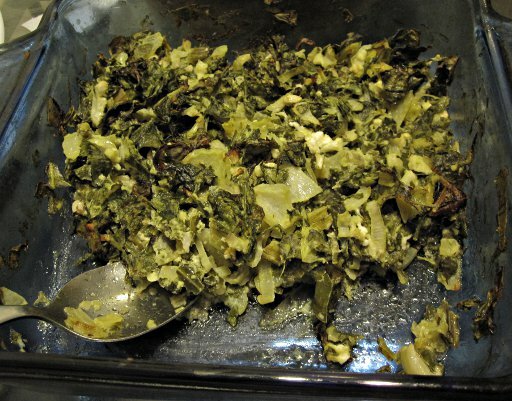 Blatzara (aka “plastos”) is the original version of the popular Greek spinach pie. The recipe goes back thousands of years, but only a few villages still make spinach-pie this way. In fact, this is one of these recipes that you can’t find anywhere else online. I’m originating from the Souli mountain villages of Epirus, so this is as original as it goes. I double-checked with my mom & grand-mother too. 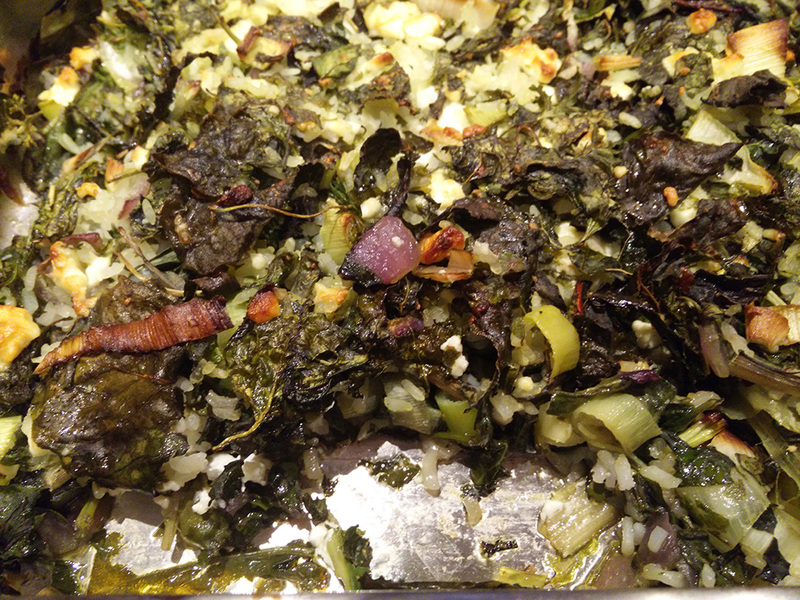 Blatzara is made similarly to modern Greek spinach-pie, but without a dough/phyllo. It does retain the same taste though, and it’s easier to make! This makes it perfect for the Paleo diet, with only a few small changes: I used “riced” cauliflower instead of white rice (although white rice was optional in the original recipe anyway). The rest is the same as in the ancient recipe! * 1 cup of other green leaves you got (e.g. chopped amaranth, kale, collards, beets, dandelion etc). Use more spinach & swiss chard if you can’t find such kinds of greens. 1. Wash the leaves with cold water. In a big bowl place the chopped onion, parsley, leeks, mint, spinach, sorrel, Swiss chard and other greens. Add salt to taste. Using your fingers, work the mixture, until they almost start looking wilted. 2. Crumble the feta cheese using your fingers, and add it to the mixture. Add the riced cauliflower and olive oil too. Carefully mix all ingredients again. Pre-heat the oven at 400 F (200 C). 3. Move everything in a deep baking pan. The raw ingredients should be forming a mass of about 2.5 inches thick in the pan. 4. Bake for about 45-50 minutes. Half-way through check it out and notice if it looks too dry. If yes, drizzle a bit more olive oil on top of it. When it has started getting some nice color on top, remove from the oven. 5. Serve it and squeeze some lemon juice. My non-dieting French husband loves it with butter (since it gives the dish a more creamy texture). Enjoy!